1969 Dodge Charger Daytona is Highly Sought After By Collectors! People say patience is golden, meaning that if you want something and be patient enough you may have it one day! Of course, sometimes it takes years, but one day you will have what belongs to you! Well, the video we have on today`s menu, is about one incredible bar find (due to the rarity of the automobile) and also corresponds with the aforementioned. Namely, we are talking about a 1969 Dodge Charger Daytona, which was found in the small town of Glenwood, Alabama! The man who owns it now, Charlie Lyons owner of Charlie’s Classis Cars, had a dream of possessing exactly a 1969 Dodge Daytona Charger! This particular automobile had been owned by only two persons (excluding Charlie) and has only 20.000 miles on it! Out of 503 Daytonas ever built, this is one of the rare ones with bucket seats, automatic transmission, and a console as well! Additionally, the engine and paint have remained the original i.e. 4-barrel 440 and Charger Red paint. The flames that are drawn at the front were an idea of the second owner (painted when he was 18) for the purpose of his Spring Break adventure! At last, click here to see one more astonishing 1969 Dodge Charger Daytona! This beauties are rare like diamonds! 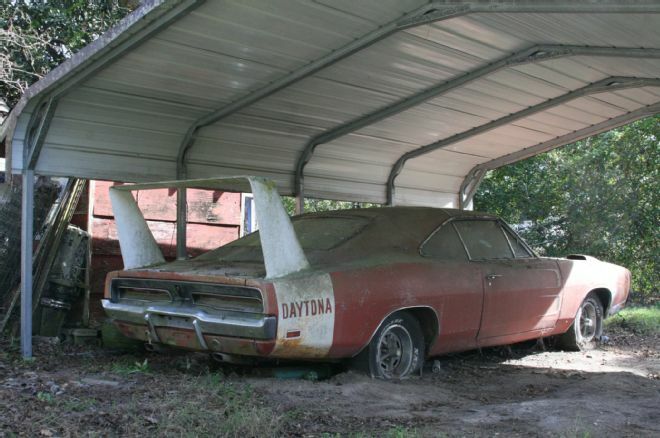 Dodge Daytona Barn Find--Part 1Did you see this Dodge Daytona barn find? Now this is what you call patina!